In 1741 – or so the story goes – an assistant to a George Frederic Handel, after shouting through a closed door for several minutes, walked into the room only to find him in tears. The sheet music that Handel was holding up was Hallelujah, a movement from The Messiah which is now regarded by many as the most remarkable music ever composed. If you have ever had a chance to listen carefully to a good recording of Hallelujah – or better yet – a live performance, you already know what he meant. One can’t really say that he saw the face of God. But – whatever experience he had that day that resulted in this short piece – it must have been profound. But it is also a reminder that – in the end – describing the way that we discover God as a mere “conversation” – as if it were all about discovering all the right information – is utterly inadequate. The interactions that I’ve described in previous posts will be grossly incomplete unless they include science, history, and math. But they must necessarily also include art, poetry, and music. God is not, after all, a cosmic computer, generating endless facts which he is asking us to digest. Facts. Science. History. Math. Those are all beautiful things, but they are not the totality of all things. And they are certainly not the totality of Who God is. That is why, in the end, I like to think of God as a master musician. Like Handel, he has composed a massive work – ingrained in the fabric of our consciousness and the universe itself. Our job is not simply to hear it, but to live out our lives in such a way that we are dancing with it. …and here ends this series of posts. May all of your conversations be seasoned with Spirit of God. May you find truths in those conversations that resonate in the deepest part of your soul. And, as you reflect on those truths, may you find your own place in the glorious chorus that dances eternally to the music of our Maker. Before concluding this series, lets pause briefly to remember two things about the “conversation” in which we are involved. 2. Those who are marginalized within society. For examples of the first, we need look no further than the Psalms, where lament after lament is offered up, not because God is present and known, but because he is (seemingly, at least) absent. They beg the question: Why is God absent? For examples of the second, we look to the teachings of Jesus, who explicitly taught us that when we come to know those who are in need, in prison, or who are ill, we come to know him. Why are these people an important part of the conversation? I don’t know all of the reasons, but I am fairly sure that one reason is that they keep us from over-simplification and complacency. God cares about the marginalized. Likewise, the marginalized are, somewhat ironically, the ones most likely to feel an absence of God. Unless we hear the cries, tears, and concerns of the poor, the oppressed, and the sick, we are unlikely to get a clear picture of God himself. We are unlikely to ask the hard questions that are asked by the Psalmists. If you find that your spiritual conversations tend to be shallow and unsatisfying, one reason may be because you simply aren’t letting all of the right people into that conversation. Your network, so to speak, has become “closed off” to those particular voices. In the last two posts, I’ve explored the idea that all Christians – to one degree or another – are a part of an open conversation about God and – more specifically – how God is revealed through the life, death, and resurrection of Jesus. This represents the way different clusters of groups, in conversation with each other, might work to get a clearer picture than they could get if they were closed off. The phenomenon by which that picture develops is associated with the scientific concept of emergence. This diagram is, of course, a gross over-simplification. To get a more accurate picture, imagine hundreds of groupings representing churches, denominations, schools of thought, and nations, all interconnected. The web of relationships and the flow of the conversation – will necessarily be very complex. I left off in the last post with this question: How do we know when we’ve hit on an important point? To answer this question, lets consider the concept of harmonic (or sympathetic) resonance. When I was a teenager, I had one particular shower that I used almost every day. It was a shower, not a bathtub with a curtain, completely enclosed, with a glass door. I didn’t usually sing in this shower (no, really, I didn’t!). But as I was singing in the shower one day, I noticed that if I hit an exact tone, the glass door would vibrate, sometimes quite violently, if I hit the exact pitch. The door, it turns out, has a particular “harmonic likeness.” When it is in the presence of the right tone – it responds to it, as if it were “meant” to sing that note. Glass, in particular, is a subject to this phenomenon. Consider the way a window pane vibrates to a booming bass explosion from your home theatre, or the way an opera singer can break a champagne glass by hitting just the right note. In musical instruments, this can create a particularly fascinating phenomenon known as “overtone.” An overtone, in a violin, occurs when you play one note at a level where the entire instrument also vibrates with the harmonic likeness of the main tone. Cool stuff. Now, again, to the point. I think that most of us will have – from time to time – experiences that are best compared to harmonic resonance during the course of a conversation. Somebody says something to us as we are exploring a question and then – bang! – its like a light goes off inside of us. Suddenly, we see the world – or its Maker – in a way that we had never seen it before. Sometimes, powerful ideas will slip their way into the massive conversation that I’ve tried to crudely illustrate above. When they do, as the idea travels along through multiple groupings – perhaps being changed slightly here or explained in a slightly different way there – a point may come where the “light” comes on, but on a massive scale. Suddenly, lights come on all over the network. People think “this is something important.” They talk about it more. And the idea spreads. Not unlike ants find food. And if you want to test whether you think your own “light bulb” has pointed you toward an important truth, the best way to do it is to see how many other light bulbs are going off in connection with the same or similar ideas. Is the tone you hear resonating elsewhere? Why is this more likely to happen within a wider conversation? Because many, many different concepts – “notes” if you will – are being generated by different people and groups. When enough of them hit the right pitches – when the ideas come into harmony like a barbershop quartet – the overtone may suddenly sound in many others…and the idea grows. In this symphony, the most fundamental notes – of course – have always come from (and I suppose always will come from) the scriptures. It is always against them that we test our own ideas for resonance, but they can never themselves provide all of the music. In the last post, I suggested that – to acquire an understanding of God – Christians have participated in (and continue to participate in) a very old, ongoing conversation. Here, I want to give us a way to visualize that conversation, with all of its participants. Of course, we live centuries upon centuries after these events. We speak a different language and come from a different culture. We therefore have to rely on translators to help us come into conversation with Luke and the witnesses that he reports on. In addition, we may rely on scholars who can help us to better see how Luke and others – who were much closer to “ground zero” – understood and interpreted the events. Notice how the translators and scholars are also simultaneously bringing us into conversation with other Bible writers, like Isaiah. This helps us to understand both Luke and Isaiah better. At the same time, however, a more contemporary conversation is taking place. Lets try to visualize that conversation two ways. Here we see you and other people like you. Presumably, all of you are – to some extent at least – using your translations in an effort to hear the voices of those who were closer to “ground zero.” However, you are only interacting with a limited number of people who are also interacting with you. This is sometimes called a “closed” system. This might be represented by a church, a denomination, or a small group. Its easy to get agreement in this context, because you’re limiting the number of people who participate, and those who join in and don’t like parts of the conversation are unlikely to continue in it. The problem, as we discussed in the last post, is that nothing new or better is likely to emerge out of this conversation. If you’ve ever been a part of a church or Bible class where people just seem to keep saying the same things again and again in discussions, sermons, etc. – its likely because the system you are a part of is somewhat closed. When even one extra person comes into conversation with at least one member of the group, suddenly new ideas can be introduced to EVERYONE. The conversation, even for those who are “closed off,” widens. Now you have multiple groups within a single culture and time, all talking about their experiences/encounters with God, all trying to interpret them in light of the events that come from “ground zero.” Out of this process, everyone is likely to come to a much clearer understanding of how God is revealed to us and through Jesus than they would if they remained in closed systems. Christians should add that we believe this entire process is infused by the Spirit of God. We live in trust that he is guiding the conversation and its direction, and that God has been doing so from the very beginning. This is essentially the process of emergence, which was discussed in the last post. So how do we know when the conversation has hit on something important? In the next post, we’ll talk about harmonic resonance as a metaphor to explain that phenomenon. As individuals, ants are neither particularly smart nor particularly complex. A single ant may spend hours wandering about randomly looking for food to no avail, and with little discernable pattern in its search. Its actions, I’m told, are random – virtually void of intellect. Yet, as colonies, ants are remarkably sophisticated. They can build (and rebuild) homes, defend them, and assimilate all of the nutrition that the colony needs. What enables ants to accomplish so much? The question has puzzled biologists for years. Somehow, a collection of seemingly chaotic, randomly behaving organisms manage to collectively accomplish something that any one of them cannot. There is nothing directing them, per se. They simply seem to have collective capabilities that transcend what any of them can accomplish individually. Steven Johnson, an American science author, has recently written a book on this subject called Emergence: The Connected Lives of Ants, Brains, Cities, and Software. Unfortunately, I have not read the book, but there a really good summary of it in this episode of the Radiolab podcast. Emergence is what happens when an interconnected system of relatively simple elements self-organizes to form more intelligent, more adaptive higher-level behavior. It’s a bottom-up model; rather than being engineered by a general or a master planner, emergence begins at the ground level. Systems that at first glance seem vastly different–ant colonies, human brains, cities, immune systems–all turn out to follow the rules of emergence. In each of these systems, agents residing on one scale start producing behavior that lies a scale above them: ants create colonies, urbanites create neighborhoods. One curious phenomenon involves the way ant trails develop. Apparently, if an ant stumbles across something that appears to be nutritionally useful, it begins to leave a chemical trail behind which other ants may (or may not – at the start) pick up. However, if another ant picks up the scent, and also finds something useful, it will also add to the scent. Eventually, it becomes so strong that a huge number of ants will “stumble” into it and – thus forms the trail. A similar phenomenon can be found on the sociological level. Ask a large enough group of people to guess something – the weight of an animal, the number of jelly beans in a jar, whatever – and the average of all the guesses will almost always be dead-on. One person’s guess is virtually useless, but – if you get enough people involved – the collective guess is almost always right. You are probably already familiar with the fable of the blind men and the elephant. In this story, different people touch the elephant in different places and perceive different things, though there is – in the end – only one elephant. Extending that fable a bit – consider what happens when the blind men begin to speak to one another. As they compare experiences, they can begin to get a “picture” of what the elephant might look like, even though any one of them could never have imagined what the elephant looked like based on his individual experience. Some of the most incredible scientific discoveries of the last two centuries have been a result of this process. Scientists can take the work of their colleagues, refine it, create more sophisticated hypothesis, and arrive at conclusions that no one person would ever discover. The quest for the grand unification theory is, in a sense, a highly complex conversation between thousands of scientists out of which may eventually emerge a deeper understanding of the universe. Which brings me back to the window blind. If God is, in fact, only partially revealed to any one person, then it makes sense that the best way to learn more is to enter into conversations with other people who have (or haven’t) had experiences of God. We can sometimes add to the conversations, but we are mostly there to listen. These conversations, however, are not momentary phenomenon among 2-3 people. They are deep, ancient dialogs – involving the dead as much or more than the living – and they involve tens of thousands of people. At the heart of those conversations are those who found themselves in the aftermath of what they claimed was the most remarkable event in human history – the resurrection of Jesus, the Messiah. They are the communities of the First Century church. It was out of those communities that our New Testament was formed. And, among other things, they point us to the text of the Old Testament to interpret what they had experienced. Since their time, there has been a virtual explosion of thought about what had happened, what they had experienced. Thousands upon thousands of voices have joined with them. It is into that conversation that we must enter. And in the next post, I’ll try to put this idea in a slightly more concrete form. Should one human being be forced into the service of another? Its a simple question. And most of us, I’m sure, would respond to any answer other than “no” with puzzlement, if not outrage. For the vast majority of Christians, the entire concept of human trafficking is utterly, morally abhorrent. Go back two centuries, however, and you will encounter a much different, more controversial situation among Christians. “[Slavery] was established by decree of Almighty God…it is sanctioned in the Bible, in both Testaments, from Genesis to Revelation…it has existed in all ages, has been found among the people of the highest civilization, and in nations of the highest proficiency in the arts,” Jefferson Davis once said. Alexander Campbell – a noted figure in the American Restoration Movement – once made a slightly more guarded statement. “There is not one verse in the Bible inhibiting slavery, but many regulating it,” he said. As such, “It is not then, we conclude, immoral.” As best I can understand it, Campbell’s political views with respect to abolition were not quite a entrenched as this quote suggests. However, his view of the ultimate, biblical position on slavery we clear enough. The problem that is posed by the observations of people like Davis, Campbell, and Furman is that – essentially – they are right. One might quibble, in particular with Furman’s assertion that everyone has a right to slaves. However, when it comes out to making a clear case against slavery, the Bible isn’t explicit enough to help the argument. Indeed, the tacit acceptance of the institution of slavery by the writers of scripture only serves to fuel the sort-of arguments that were made by Jefferson Davis and Confederate sympathizers. A century later, during my formative years, similar issues began to arise with respect to the treatment of women. “Wives, submit to your husbands, as to the Lord,” the apostle Paul once wrote. For centuries, this – and other similar texts – were taken as a sign that women should exist in a subordinate, subjugated state in relationship to men. Yet, today, a large number of Christians have come to think of men and women as equal, without one holding any authority over another. This has in part been the result of scholarship which shows that the early Christians held views of women that were revolutionary for their day, though still antiquated by our own standards. Still, if one looks to the Bible itself, one can find little more than a tacit acceptance of a culture in which women assume a subordinate position. As I’ve reflected on the roles of slaves and women within society during the last few months, and on the Biblical silence on both subjects, I’ve been led to what seems to me to be a fairly obvious conclusion: if we rely on scripture alone to discern moral authority, our capacity for understanding and accomplishing good will be decreased, not increased. I do not say that lightly, because I realize it is a radical departure from fundamentalism and from most forms of evangelicalism. Still, if one bothers to be objective in the least, it strikes me as an inevitable conclusion. I’ve also, however, wondered – how is it that Christians eventually came to a virtually unanimous conclusion that slavery is morally abhorrent? And how is it that similar things are happening today with respect to our understanding of women? It has plainly happened, in part, because of our love for and dedication to scripture. Yet, something more is going on. I’ve considered several answers to this question. But the one that I have found most satisfying finds its roots – ironically – in modern biological and sociological science. As such, in the next post, we will take up the advice of one of the biblical writers – Solomon – and, in answering our big question, we will consider a very small thing: the ant. In the last post, I pointed out that we should be careful when we throw around the word “authoritative” to describe the Christian scriptures because, even the scriptures themselves make it very clear that we are to consider Jesus as authoritative. I think that any approach that tries to treat scriptures themselves as “authoritative” ironically puts one at risk of idolatry, one of the very things that the scriptures tell us to avoid. I want to take things a step farther now, and ask this question: Does it even make any sense to talk about the Bible as “authoritative”? The presumption behind the concept of authority is one of command and obedience. In other words, if someone or something is authoritative, it must be expecting me to submit to its commands, instructions, guidance, etc. One of my problems with the word “authoritative” is that not all of scripture seems to be providing commands, instructions, guidance, etc. Take Psalm 74, for an example. Here, the Psalmist cries out, mourning that God has rejected him. Adversaries have crushed God’s people, yet God has taken no action. God, the Psalmist recognizes, is a powerful creator-God. He asks God to rise up and defend his cause for the sake of his covenant. Still, there is no answer. Where is the guidance in Psalm 74? Where, for all that matters, is God himself? The text is a lament over the absence of God. No divine instructions are to be found here. This Psalm is best understood as a question, as puzzled grief, even as a veiled accusation of betrayal. But it is not a command. To select another random example, lets take I Samuel 25 and 27, a particularly unflattering series of stories in which David, anointed as King of God’s people (but on the run from Saul, who is also in some sense the current King), decides to become a common marauder, robbing the weak of their cattle and other assets. Where is the “instruction” here? As a final example, lets take a statement that does – on the surface – appear to be instructional. In the book of Romans, the instruction is given to “Greet one another with a holy kiss.” Simple enough. Yet, I know of very few religious communities who actually do this. This hardly seems respectful of scripture’s authority. The presumption is that, in each biblical text, some “eternal truth” is hidden. However, to understand it, we have to first extract from the text its meaning to its original audience (a process called “exegesis”). 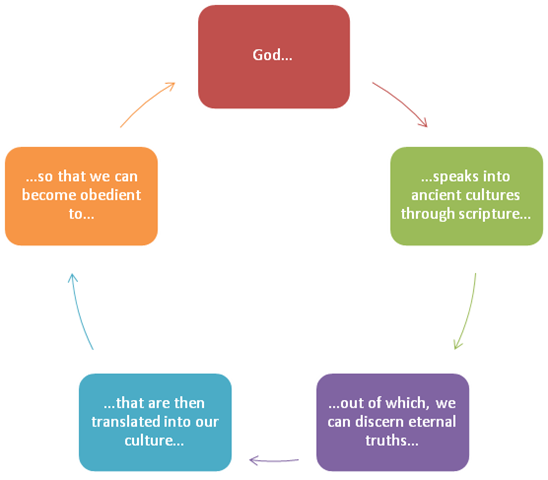 Then, we can discern a more generalized truth from the text that can be applied to our own culture and times, and we can thus learn how to be obedient to the “authority” that comes out of the scripture. This process “works” fairly well in many situations. Take Holy kissing, for example. It made sense to freely exchange kisses in the culture of the early Church, but today kissing is more closely associated with sexuality. As such, under this model, we might refrain from kissing in our culture, while recognizing that there is an “eternal truth” that requires us to greet each other warmly. Thus, we search for other ways that “work” within our culture to recognize/greet each other – such as shaking hands or even hugging. The story of David the marauder can, similarly, be seen as a cautionary tale regarding the ease by which one can be drawn into conduct that is harmful to others. We can then reflect on the ways we are tempted in our own time and place. Still, this model is quite imperfect and subjective. Scholars can debate endlessly over the correct meaning of a term, an entire book, or even the overall theology of a well-known writer such as Paul. And the process of trying to distill the text so that you remove all of the cultural baggage and come to its pure meaning is even more maddening and subject to radical disagreement. The process is good at yielding useful, subjective results, but such results will always be sketchy at best, and there will always be all sorts of room for discussion in the process. (This, I will argue later, is not a bad thing at all). More to the point, however, this model doesn’t always work. The Psalm where we began – and indeed a good part of the book of Job, which raises similar themes – is a great example. There are no lessons to be learned in some texts of the Bible. Thus, while the process described above can sometimes be useful, it doesn’t complete the picture for me. Scripture can only begin to speak in meaningful ways when we begin to see it as much more than a divine instructional manual. Furthermore, if we limit our understanding of God’s purposes to scripture, we can actually diminish our capacity for good. And for the next two posts, we will look at two particular examples (first, slavery, and then the subjugation of women) of why that is the case. You are currently browsing the archives for the sacred dance category.